Lingusamy and Vishal are back with a sequel to the blockbuster hit after 15 years. The movie lives up to the action expectations but falls flat on a “usual” second half & unwanted songs. 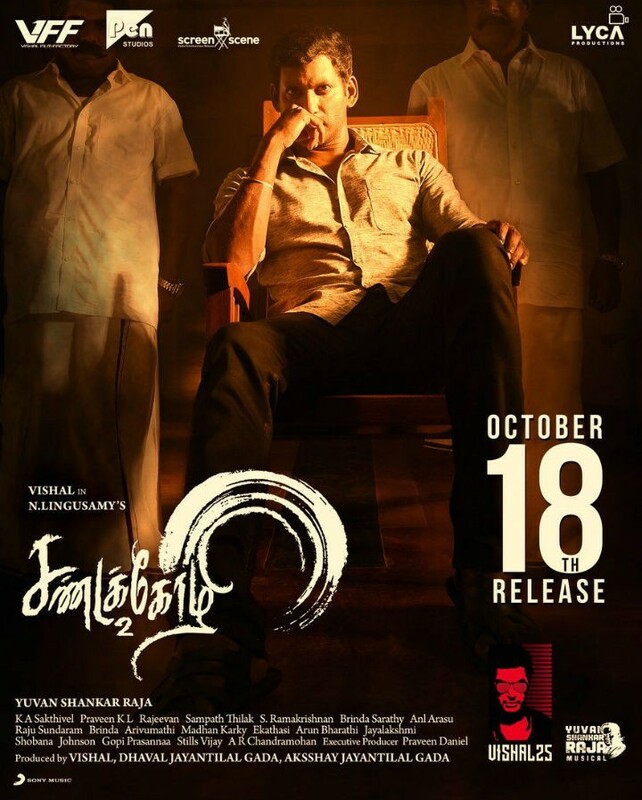 Vishal and Varalaxmi Sarathkumar are the talk of the town with very good performances. ‘Sandakozhi’ released 15 years back and it was a huge blockbuster for Vishal. The movie even rewrote how an action movie should be. Now, the sequel is made after a long hiatus and does the sequel live upto the expectations? Let’s see in this review. Balu and his father have to protect a young man from a woman who took an oath to get vengeance on his entire clan. Pechi (Varalaxmi) and the men in her family tries to hunt down Anbu, who is the last male in a clan and they sworn revenge against them. But they are unable to do anything as Balu and his father protects him. A Week-long thiruvizha in which seven villages come together happens after 7 years and Balu and Ayya wants to make sure it happens peaceful. Does Pechi interfere? What happens to Anbu? All the answers are on the big screen. Okay! The movie might have some shades of ‘Vamsam’, but Vishal rules this with his action sequences. Director Lingsusamy who failed in ‘Anjaan’ is truly back now. The director has given a gripping mass masala entertainer. In fact, Keerthy Suresh has done same as Meera Jasmine from the first half. She is as chirpy as Meera Jasmine. Even though the happenings are familiar like the lead heroine mistakes Balu to be a driver in Ayya’s household and keeps ordering him about, which he is only happy to do. However, the movie falls flat in the second half with unwanted songs and routine cliches. The songs act as real speed breakers in such a spine-chilling never crackling action flick. Varalaxmi has done a good job and has challenged Vishal equally and her character will be the talk of the town for a while. When is Deepika getting hitched?